See how the universe evolved into what we see today in this infographic tour of our cosmos: "The History & Structure of the Universe" (below). SPECIAL REPORT: Our universe is both ancient and vast, and expanding out farther and faster every day. This accelerating universe, the dark energy that seems to be behind it, and other puzzles like the exact nature of the Big Bang and the early evolution of the universe are among the great puzzles of cosmology. There was a time when scientists thought Earth was at the center of the universe. As late as the 1920s, we did not realize that our galaxy was just one of many in a vast universe. Only later did we recognize that the other galaxies were running away from us — in every direction — at ever greater speeds. Likewise in recent decades, our understanding of the universe has accelerated. In this 8-part series of stories, videos, pictures and infographics, SPACE.com looks at some of the most amazing revelations about the universe and the enduring enigmas still to be solved. The universe is filled with stars, galaxies, planets and more, plus a veritable buffet of invisible stuff like dark matter astronomers have yet to see. But scientists have pinned down some of the major ingredients of our universe. Take a look at star stuff and more in this video show. Our universe is 13.7 billion years old, but astronomers are peering deep into its history and are getting a greater understanding of how the first stars formed, and how the earliest galaxies came together. 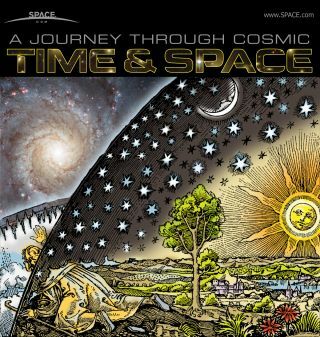 See images, illustrations and diagrams of the universe from now back to the Big Bang. The widely accepted theory for the origin and evolution of the universe is the Big Bang model, which states that the universe began as an incredibly hot, dense point roughly 13.7 billion years ago. Here's a breakdown of the Big Bang to now in 10 easy steps. Tour the universe's 13.7-billion-year history, from the Big Bang to planet Earth today, in this SPACE.com infographic series. The Big Bang: What Really Happened at Our Universe's Birth? Big Bang theory holds that our universe began 13.7 billion years ago, in a massive expansion that blew space up like a balloon. Here's a brief rundown of what astronomers think happened. The dark ages of the universe — an era of darkness that existed before the first stars and galaxies — mostly remain a mystery because there is so little of it to see, but scientists intensely desire to shed light on them in order to learn secrets about how the universe came into being. In the 1920s, astronomer Georges Lemaître proposed what became known as the Big Bang theory, which is the most widely accepted model to explain the formation of the universe. Not only are scientists unsure how the universe will end, they aren't even sure it will end at all.